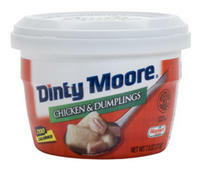 Dinty Moor Chicken and Dumplings. Microwave cup meal. A delicious alternative to a snack. Great to have around when going out to lunch isn't an option.